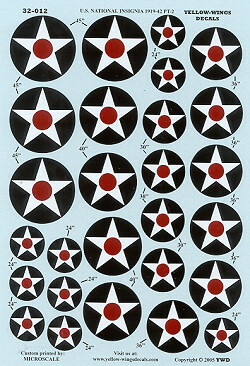 This second big scale insignia sheet contains 24" and 36" roundels for the Neutrality Patrol that the US flew on the east coast once the war in Europe was underway. In addition, Yellow Wings has included insignia sized for the 1/32 F4B-4 and BF2C-1 that are produced by Hasegawa. As is the standard with Yellow Wings, a comprehensive guide for decal size and placement is provided with the sheet so you can get things in their proper location. A super sheet that will come in handy. Thanks to Yellow Wings for the review samples. If your store cannot get them, you can order direct.